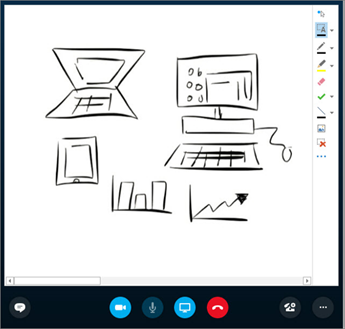 Focus on the things you're doing together, even when you’re far apart, with real-time co-authoring, desktop sharing, and application sharing. Share your Desktop to show the entire contents of your desktop. Share a Window and double-click the program or window you want to display. Select Stop Sharing when you're done. In the meeting window, select Share Content , and then select Co-Author Office Doc. Select the file you want others to be able to edit. 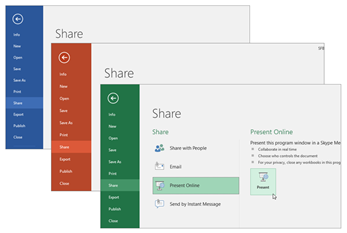 In the meeting window, select Share Content , select More, and then select Whiteboard. Select the pen, highlighter, or other items in the tool set as needed. 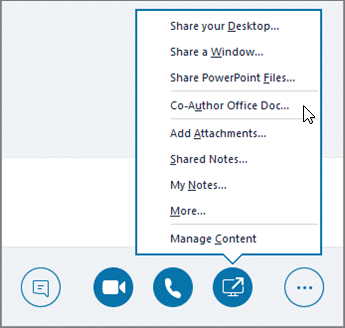 Open the presentation, spreadsheet, or document you want to share. Select File > Share > Present Online > Present.